Enjoy cheap calling rates… and the great safari too! Kenya is famous for its abundance of rare and amazing wildlife. The country is also famous for its natural beauty, incredible scenery and proximity to the rest of East Africa. Kenyan tea, coffee, agricultural products, circus and zoo animals were exported all over the world and have gained immense popularity. Kenya has a very close relationship with the US. Beyond President Obama's Kenyan connection, there are over 100,000 Kenyans who live in the US. Their valuable contribution to the US economy means they are constantly in touch with Kenya. simplecall has rolled out a cheap international calling rate for Kenya that is affordable. This allows many Kenyans to keep in touch with their families. Above all, our service has amazing features such as the ability to top up online and the fact that it is PINless. simplecall believes in charging only what is fair and doesn’t make mystery charges like many calling card companies do. The price you see is the price you pay and you will never be caught off guard by random connection or termination fees. You should use simplecall to make international calls to Kenya to enjoy our world class quality and customer service. Our rates for calls to Kenya start from the low price of 44.05¢ /min for landlines and for mobiles. 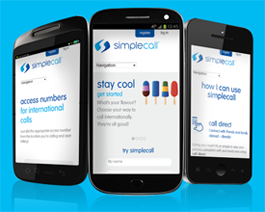 Next time you want a hassle-free calling experience, look no further than simplecall. Register with us at www.simplecall.com. We promise you will feel much better and will start loving being simple with simplecall.